In this paper we introduce LDBC Graphalytics, a new industrial-grade benchmark for graph analysis platforms. 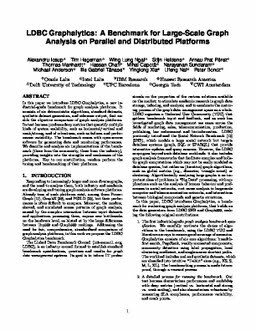 It consists of six deterministic algorithms, standard datasets, synthetic dataset generators, and reference output, that enable the objective comparison of graph analysis platforms. Its test harness produces deep metrics that quantify multiple kinds of system scalability, such as horizontal/vertical and weak/strong, and of robustness, such as failures and performance variability. The benchmark comes with open-source software for generating data and monitoring performance. We describe and analyze six implementations of the benchmark (three from the community, three from the industry), providing insights into the strengths and weaknesses of the platforms. Key to our contribution, vendors perform the tuning and benchmarking of their platforms.